An Amazing Week with Uncommon Threads! Just a sampling of the works submitted to Uncommon Threads. 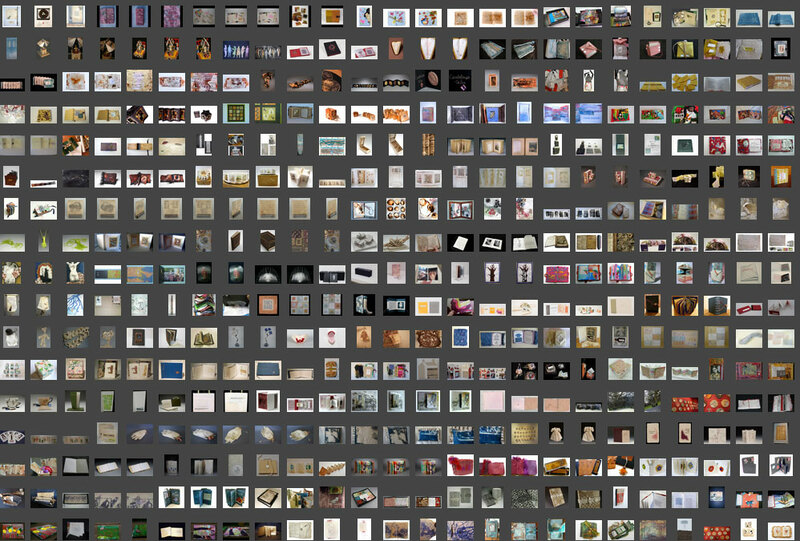 Wait until you see the beauties I just spent my week with: 227 pieces of important book and paper art by 120 artists. The theme for Uncommon Threads was “The Handicrafts in Book Arts” and it proved to be a very popular theme. Artists from all over the United States plus England, Australia, Argentina and Canada submitted an amazing array of works using beading, sewing, embroidery, knitting, felting, handmade paper plus just about any other traditional handicraft you can think of. The process of jurying a show is really something unique. Having juried many shows both here for the gallery and for other outside shows, I am always amazed at how much time goes into the process. Usually we have a guest juror or two for juried shows. The nice thing about a guest juror is that I have someone else to blame when artists ask me why they didn’t get in. For this show, I really wanted to jury the show myself. Having taken sewing classes in 4-H in middle school, and having played with just about every kind of handicraft myself at one point or another (macrame, anyone? ), I was really excited to see how artists were using these crafts in the book and paper arts realm. One of the important things for me is to avoid rash judgements. When the images come in they are immediately downloaded into one big folder on my computer and not looked at again until everything is in. I consciously avoid the urge to judge or categorize any work too soon. When I sit down to really start the jurying I spend a lot of time reading the artist statement for each work submitted. The thought process and the concept behind the work are just as important to me as what the work looks like in photos. I want to know the back story for each piece so that I can see that the work is a well rounded project. Then I put all of the submitted photos into Adobe Bridge and run through a slide show several times to really get to know the work. Each artist is allowed to submit up to three photos of up to three different artworks. That can add up to a lot of photos! For this show we received 619 photographs. The next step is to start rating the work. I assign each piece a rating of 1 to 5 stars and allow myself several days to go through the images multiple times. After much sorting and culling, the works that stick in my mind, those that come to me while sleeping, showering or on my morning run are the ones that I know are the most powerful and affecting works. Conversely, the one’s that I’m concerned about for one reason or another also come up at these times. One more run through each work checking sizes, materials and construction methods allows me to visualize how large the works are and how they will fit in the gallery. Next, I print out and cut apart contact sheets of all the highest-rated works and spread them all out on my dining room table. Each piece is considered for how it fits with the whole of the show. At this point I try to make sure the show is well balanced as far as techniques or themes. Do we have too many embroidered books? Or too many books about grandmothers? Are we missing any of the important techniques? 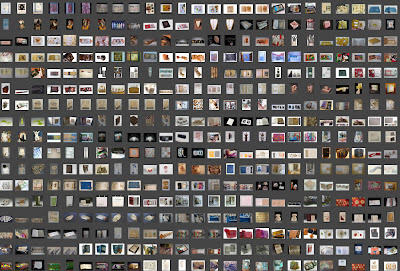 The last step is checking to make sure all of the final selections will fit in the gallery. Invariably, we always have too many pieces. This time we ended up with 65 highest rated pieces—which just will not fit in our space. Whittling it down to somewhere between 40 and 50 pieces is painstaking and difficult. At this point, late in the week, I am in love with all the works. I feel like I know them intimately and truly want everyone who submitted to be in the show. Taking pieces out, especially those by artists I know, truly affects me. But, what is the saying about hard things making us stronger? After much hand-wringing and fretting over each and every work I know that we have ended up with a cohesive, compelling exhibition showing a considered variety of techniques, concepts, themes or topics. Making sure that every artist’s voice is heard is what, in the end, makes for a terrific show. And, I can’t wait to show it to you. Thank you to all of the artists who submitted to Uncommon Threads. It was an honor to consider each and every piece. I’ll post a list of accepted artists soon. Stay tuned for more details. Thanks Laura. I'd be interested to know if you give the artists any feedback about the reasons for inclusion or exclusion – especially in the situation you describe where there are 65 of equal ranking but only space for 40. I think it would be helpful in that situation to know that the work almost made the cut. i love this post, laura! sven went through a similar process when picking films for the northwest animation fest. I think you have handled a difficult process thoughtfully. Thank you for giving us a "behind the scenes" look at what it truly takes to put together one of your wonderful shows. I think artists tend to forget we are not the only ones working hard! I love this post Laura, there is always so much more that happens behind the scenes than we see in the final show. The workload for galleries and artists both has increased with the advent of catalogs, perfect digital photos, web presence, etc. It's always disappointing when I don't get into shows, but I also think that every juror has his biases. In the end it is, at least in part, a matter of each individual's taste. I try to research the juror, especially when there is a high entry fee, or if the prospectus seems vague. Thanks Laura. I just went through a similar situation.. I was a part of a committee to choose works for my art group’s show. Now I can better see how hard it is for jurors to make these decisions. And helps one understand why perhaps a work does not get accepted. Helps with the disappointment.